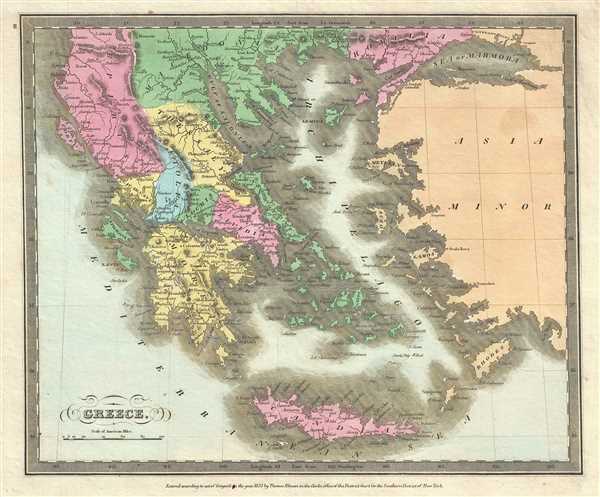 This is David H. Burr’s 1835 first edition map of Greece. It covers from the Sea of Marmora south to include Candia or Crete. Towns, rivers, mountains, islands and various other important topographical details are noted. Elevation throughout is rendered by hachure and political and territorial boundaries are shown in vivid color. This map illustrates the waning years of Ottoman hegemony in the region. The Greek revolutionaries, with the help of Russia, United Kingdom and France, finally threw off the Ottoman yolk in 1832. The Ionian Republic, under the protection of Great Britain, was also free of Ottoman control. Other Grecian and Balkan states, including Serbia, Croatia, Moldavia, Wallachia, Albania, and Macedonia, remained at least nominally under Ottoman control until 1878. According to Ristow, although Burr is credited on the title page, he left this atlas incomplete. He was appointed as topographer to the U.S. Post Office, and of the sixty-three maps finally included in this atlas, only completed eight. The rest of the maps were then completed by Illman and Pilbrow in Burr's style. This map was ‘Entered according to act of Congress in the year 1835 by Thomas Illman in the Clerk’s office of the District Court for the Southern District of New York’. Published by D. S. Stone in Burr’s New Universal Atlas. Rumsey 4628.016. Philips (Atlases) 771.